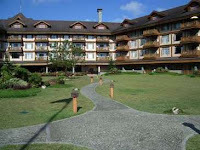 Yesterday, while I was waiting for a cab, my mind wandered to Baguio and other "provincial" places that I have been to. I couldn't help but notice the big differences that exist between Manila and those places. Baguio, for example. It is a city also but there are so many things to like - things different from the capital. 1. People are so much nicer. The sales people help you out without complaints. They actually go out of their way to help you! 2. Motorists are courteous. Generally, that is. I think that in the several hours of driving around the city, we heard a horn blown only once or twice. And the drivers actually let other drivers pass! 3. People know how to give directions. Now we only probably got lucky but each time we asked for directions - maybe a total of 5 times - we got clear instructions. Oh, and the people did not look as if they didn't want to stop and help. 4. The weather. I am not very good when it comes to cold. I was lucky that the weather that weekend was good, though. It was nippy but not freezing cold (except late in the afternoon when I had to go back to the room and warm myself up). But all I can say is that I did not sweat - and I do that A LOT! 5. Scenic views. The places that we went to were picture perfect! I am not a scrapbooking type of person but that city just makes me want to give it a try. 6. Clean market with lots of CHEAP stuff. From sausages to vegetables (which are really dirt cheap) to blankets to brooms - the market was a veritable treasure trove of cheap buys. I just wish we had more time to go around and buy more stuff. Now how cold does it actually get in the Philippines? I can bet not as bad as here in Kansas. Tell you what, I'll trade you for the next couple months, heehee.